The advantages of an environmentally conscious backyard design include the ability to supplement your meals with what you grow yourself and to enjoy the beautiful surroundings while you do so. You’ll have to break a sweat to accomplish this, though—remodeling your backyard involves a lot of work! Watch this clip from HGTV to get an idea of what goes into designing and constructing a beautiful, sustainable backyard. Follow the process from design to completion as world-renowned landscape artist Jamie Durie turns a California family’s backyard into a green retreat. If you’re looking to do some backyard remodeling of your own, you’ll need help. Call A Tool Shed at (831) 359-4769 or stop by one of our six locations in northern California to learn about our wide array of available rental equipment. Demolition Hammer: You’ve seen construction workers use this kind of hammer to break up concrete, but they are useful in demolishing any type of hard surface. We offer three different degrees of force—35 lbs., 45 lbs., and 60 lbs.—for you to choose from based on the task at hand. Operating a demolition hammer requires a strong grip and attention to safety. Here’s a tip: Start on the edges of a floor to avoid debris issues later. Bushing Tool: Use a bushing tool attachment with your hammer in order to rough out, carve, or texture masonry, concrete, or asphalt. Bushing tools can also prepare a concrete or asphalt surface for resurfacing. This tool’s multiple tips spread out the force exerted onto the surface when you want to add texture or remove just a portion of the material. Pick one up at A Tool Shed; we’ll pay the sales tax. Sledge Hammer: A sledge hammer is one of those classic multi-purpose, must-have tools for demolition. For jobs that don’t require the power of an electric demolition hammer, use a sledge hammer instead for more accuracy. Be sure to wear safety goggles, gloves, and a hardhat to stay safe from debris. Use proper form when using a sledge hammer to utilize the head’s weight and save your back from undue strain. Take advantage of A Tool Shed’s electric demolition hammers and tools by stopping in at one of our six convenient locations. Call us at (831) 359-4769 to learn more about how our 60 years of experience and outstanding inventory can provide you with the right rental tools for your project. 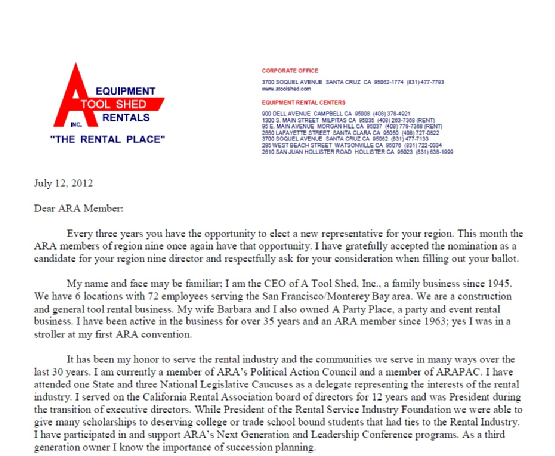 A Tool Shed, Inc. CEO, Robert Pedersen, Nominated for ARA Region Nine Director! Some jobs are simply impossible without the right tools. Others may be possible with basic tools, but the results will be sloppy in the end. Either way, the right tools help you get the job done efficiently and effectively. 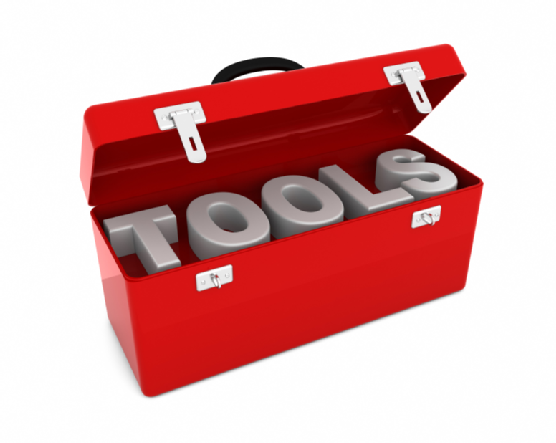 Take advantage of these links to learn about the usefulness of specialized tools and equipment . Does a tile cutter really help you make high-quality tile cuts ? Yes it does, according to AskTheBuilder.com. Visit the site to learn more. Renting tools will save you more money than buying them. Check out these tools you can rent from CBS News. Renting landscaping equipment helps you get the job done with time to spare. Learn more about some must-have landscaping equipment with this article from Yahoo! Voices. Air compressors give several different tools the power they need to perform. Find out more about the power of air compressors from Popular Mechanics. Are you considering installing hardwood floors in your home? Read HGTV.com’s flooring buyer’s guide to learn more about hardwood flooring. Whether you’re a novice DIYer or a professional contractor, A Tool Shed Equipment Rentals has the equipment and tool rentals that are perfect for your project. Give us a call at (831) 359-4769 or visit one of our six locations in Northern California for more information. Tile floors are stylish, durable, and long-lasting. These factors make them perfect for entryways, kitchens, and bathrooms. If you’re planning to install a tile floor, make sure you have everything you need to get the job done right. Start with a good substrate, like cement board, before installing the tile. Mix up a batch of mortar and then fasten the substrate to the mortared portion of the floor with screws. Let your substrate sit over night to dry. The next day, lay down some more mortar and place the tile on top. Use chalk lines and spacers to ensure your tiles and grout lines are straight. Place a liberal amount of grout between the tiles and rinse the tiles free of excess grout fairly often. Watch this video for a visual demonstration of the process. A Tool Shed Equipment Rentals has flooring tools and equipment for tile, hardwood, vinyl, and concrete floors. Rent from us to complete your project for less. Give us a call at (831) 359-4769 or visit one of our six locations in Northern California. Installing a new floor in your home yourself saves a lot of money, but it will take up a lot of your time if you don’t have the right flooring tools . What’s more is that a floor installed without the proper equipment will look shoddy and unprofessional. So, what do you need to install your new floor? That depends on the type of floor you’re installing. Consider these lists of some basic tools needed to install carpet, tile, laminate, and hardwood floors. 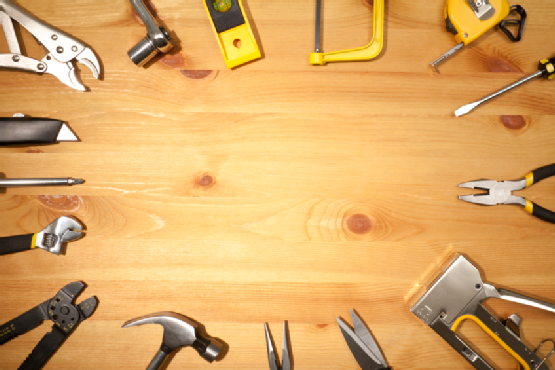 DIY carpet floor installations call for several tools to get the job done right. Carpet trimmers help you get your carpet nice and flush against the walls after the carpet is laid. Corner carpet cutters do the same for awkward corners. 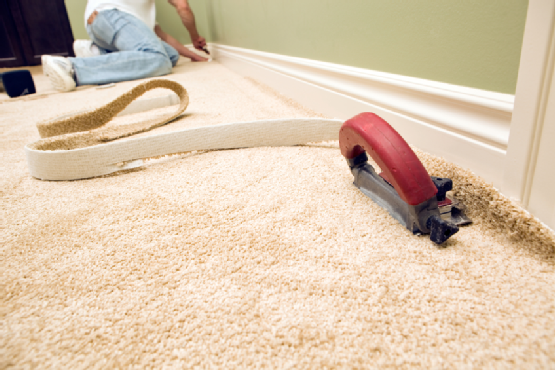 A carpet seaming iron is used to smooth out the surface of your carpet, especially where ridges have formed. Professional cutting tools are necessary for laying tile, laminate, and brick floors properly. They allow you to cut through materials easily and precisely in order to better fit them against the corners, doorways, countertop bases, and other nuances of the room. Precision cuts are especially helpful because they help you to get the most out of expensive flooring materials, like ceramic tile. A ceramic tile cutter , like many of its counterparts, is hand-powered. Hardwood floors remain one of the most popular flooring materials in homes today, but installation requires the right tools to maximize its lifespan. When securing hardwood planks to the floor, a floor tightening jack is needed to hold the planks tight against one another until the nails can be driven in to take over. The nailing process is important, too, and you’ll have to choose between a nailer kit designed for hand-powered or air-powered operation. For exotic thin hardwood, bamboo, and engineered composite flooring, use a pneumatic floor stapler with 20-gauge staples. These work best for flooring materials that range ¼ to ½ an inch in thickness. A Tool Shed Equipment Rentals has everything you need to install your new floor without breaking your budget. Don’t buy expensive flooring tools you’ll only use once. Rent flooring tools and equipment from us, instead. We have all the flooring tools mentioned above and six convenient locations, around San Jose, to serve you. Give us a call today at (831) 359-4769. We’ve all seen it: A friend or relative’s work shed is overwhelmed with dusty equipment and tools. It’s a shame when such expensive and useful tools begin to rust, collect cobwebs, and lose performance over time. The tools are no longer the brand-new, powerful, and attractive pieces they once were when purchased. For this very reason, many DIYers and project managers prefer to rent equipment instead of buying it. This saves money and time while ensuring only the best tools are used for every project. While purchasing high-performance equipment and tools often sets you back hundreds of dollars per unit, renting is a much more budget-friendly option. A quality equipment rental company lets you rent items on an hourly, daily, weekly, or monthly basis and without the added cost of sales tax, saving you money in the process. Some DIYers use the extra funds to upgrade to higher quality paints, finishes, nails, doorknobs, fixtures, flooring, and other items. 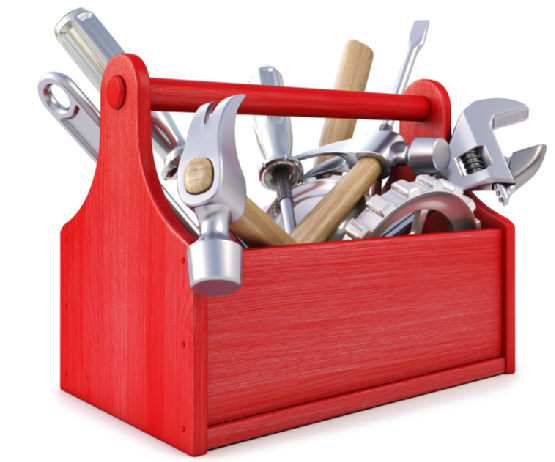 Everyone likes the look of a shiny new tool, but every tool will need maintenance and repair at some point. Owning an expensive piece of equipment means that you own its repair needs, too. Renting saves you this trouble because the rental company is responsible for the good condition and clean appearance of the tools it rents out. If you’re project’s success depends on a specialized tool and multiple handymen, having only one of that specialized tool can slow you down. Say, for instance, you need your crew to air-nail hardwood floors in two different rooms, but you only brought the one pneumatic air hammer you own. Don’t make your crew sit around waiting for their turn with the tool; rent additional tools to get your job done in half the time . Take advantage of equipment rentals to spend less and do more on your next project. Visit A Tool Shed Equipment Rentals for an amazing selection of high-performance tools and equipment for rent . With six locations serving San Jose, Campbell, Watsonville, Morgan Hill, Hollister, Santa Clara, and Santa Cruz, we’ve got a Northern California location conveniently located near you. Give us a call today at (831) 359-4769. Fix Up Your Home With Half Off Equipment Rental from A Tool Shed! Summer is here! Get your yard and lawn ready with today’s deal at A Tool Shed Equipment Rentals — $40 Worth of Equipment Rentals for only $20! Available at all 6 locations. (Campbell, Watsonville, Morgan Hill, Hollister, Santa Clara, and Santa Cruz). With six locations in Northern California, A Tool Shed Rentals should be your first stop for all your equipment rental needs! 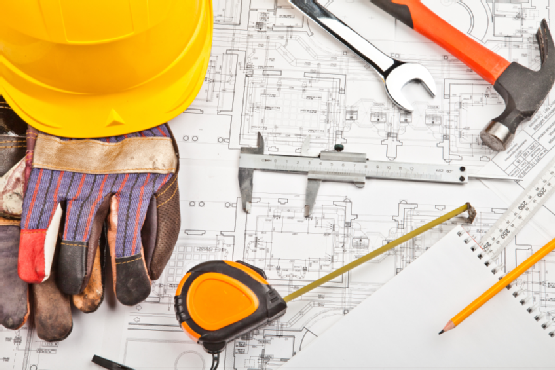 We have the tools and equipment to make your weekend or major project easier! When you need rental tools to get the job done, “Discover Service” at A Tool Shed! A Tool Shed Rentals Inc. is your equipment rental solution for all your rental needs. We have the rental inventory to help you get your job done quickly and easily. You’ll appreciate our large rental inventory and wide selections of rental tools available for the novice do it yourselfer to the experienced contractor. Our equipment fleet has been built by the requirements of our customers from over 60 years of experience. Rental equipment is our specialty with fast delivery services just a phone call away. Our equipment rental specialists are courteous and knowledgeable and will help you select the right equipment for your rental needs. We deliver small or large equipment and make it our first priority to get you the equipment when you need it. Working on something new? Give us a call, we will be happy to give advice, suggestions and referrals to make your project easier. We maintain a large manufacturer training video stock that will help with the fine points of those new or seemingly impossible projects. Come on in take a few minutes and let us show you a video on the piece of equipment you will be renting and we’re sure you will be more comfortable with your decision to choose A Tool Shed as your equipment rental partner. Did we mention NO SALES TAX?! A Tool Shed Inc. never charges sales tax on rentals. Environmental Fees? We don’t charge for those either. Hook Up Fees? Good question, not those either. Take a good look at our pricing you’ll quickly discover our great prices and we don’t have all those extra fees that will easily send your equipment rental total up 10 to 20 percent with our competition. We’re sure that will make you happy. 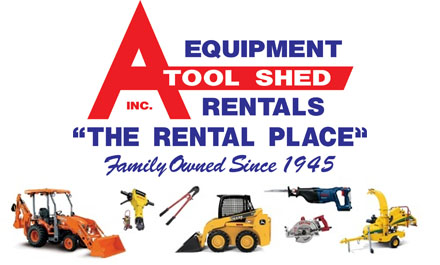 A Tool Shed Rentals Inc. will help with all your equipment rental needs for any occasion and we are just a call away! To view the entire offer, visit Get My Perks by clicking HERE ! 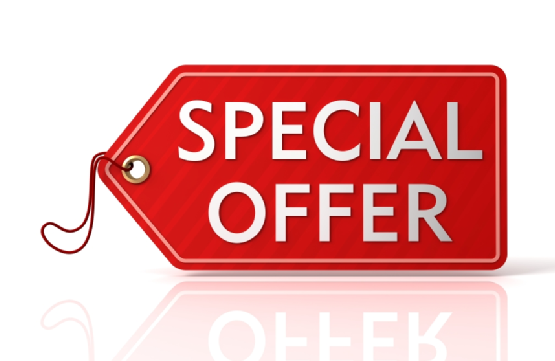 You can click HERE to purchase this great offer now! The serious tools and equipment available for rent will help you with projects around the house, like gardening and floor installation, and other rentals will help you have some summer fun. Check out these links to find out more. Branch clipper machines are perfect for clearing fallen branches from your property, but because of their powerful parts, chipper machine safety must be exercised when you use one. Look over these chipper machine safety tips from OSHA.gov. Rent a huge Charcoal BBQ with a built-in Rotisserie to impress your friends at your BBQ party this summer. Click here from some rotisserie chicken tips . Ceramic tile cutters will help you install a professional-quality tile floor. Learn how to use ceramic tile cutters by clicking on this link to the San Francisco Chronicle . Tile floor transitions help give your floor a smoother, more visually appealing look between rooms. Find out how to install a tile floor transition from DIYNetwork.com. Tillers are great for preparing your garden for the growing season. Learn about rotary garden tillers and how to use them at this link. A Tool Shed Equipment Rentals has six locations in California, including three in the cities of San Jose, Santa Clara, and Santa Cruz. Give us a call with any questions you have about our sales tax-free rentals. Our number is (831) 359-4769.